Not Doulton Bulldog but special surprise! 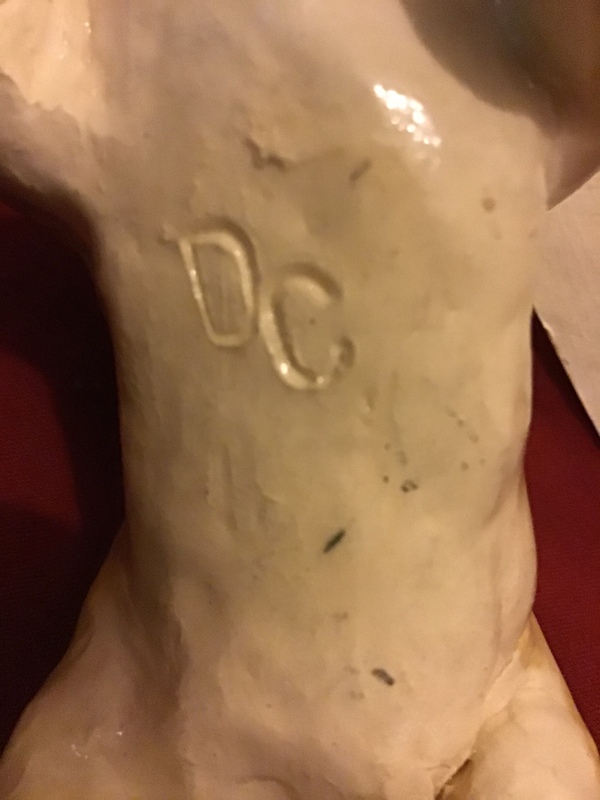 Hi again readers I hope your all good the piece I want to talk about is not Doulton Bulldog (I’ll explain more in a mo) but a special piece that my wife found and surprised me with, admittedly it was after a couple of days of wedding sparing lol. The reason for Doulton Bulldog in this article is because it still out ranks other keywords and clever Seo may get me more interested viewers, I will endeavour to put our more Royal Doulton Bulldog articles if they are so popular but I’m of the belief most are searching for the actual figurines and not blog articles on the subject but I’m no expert. 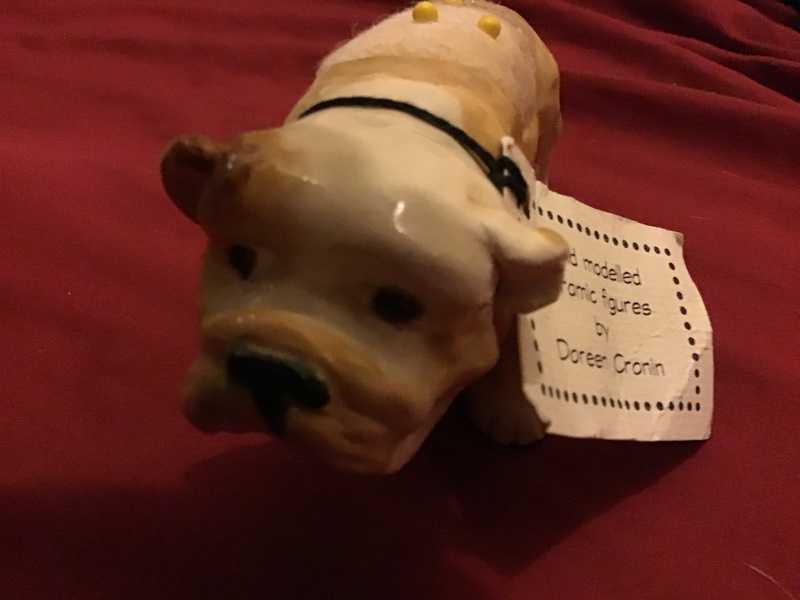 When I opened the parcel and unwrapped the piece I was looking at a vintage hand made pin cushion bulldog statue ! I was in love straight away there’s something about this piece that really got my mindset back into bulldogs, (I can use the header here) You can plainly see it’s not Royal Doulton Bulldog memorabilia but for some reason I enjoyed receiving this piece more than a few Royal Doulton Bulldog pieces. Coleen Cronin is the creator of this little fella and any research so far has only frown up an illustrator that I contacted on twitter to see if A she made this and B if there are others, I have a funny feeling she is said creator as the piece looks a lot like her artwork yet I maybe wrong. Pin cushions galore now ! 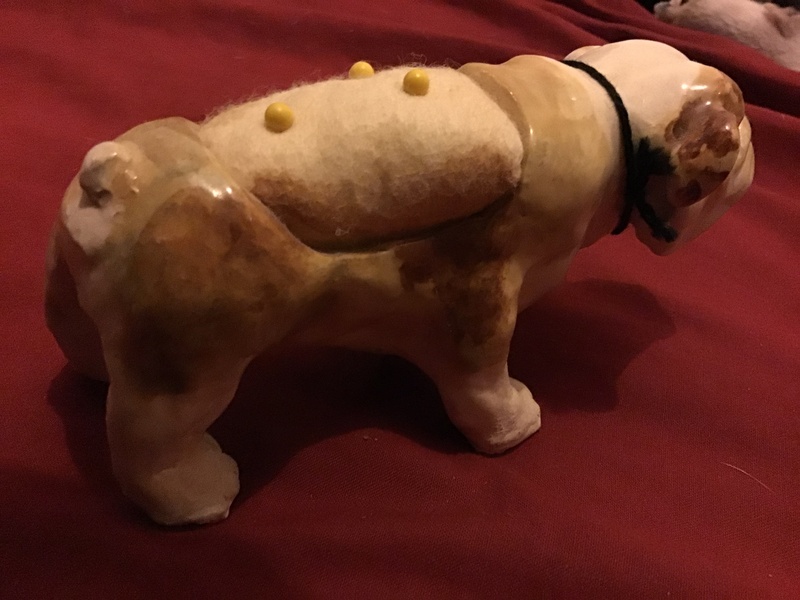 This has to be the largest bulldog pin cushion I’ve seen and it will display nicely with our others that include antique porcelain ones silver Victorian pieces and various vintage metal pin cushions that we have here at Collectibulldogs. Thank you very much for the lovely gift it was a total surprise especially in January when no ones got any money left spare ! It’s a signed piece so there has to be some record I’ll just have to start digging deep as I’d like to see if there is more of them out there. Now we have a new host there have been some technical issues in migrating the website fully, partly my own fault but you should notice old features appearing back very soon, we lost our automated sharing capabilities the social sharing icons and the Trustpilot widget. Once our host has enough funds squareone digital will start fixing the websites internal issues and then set about adding new features and ideas to improve the website for you folk, i for one am looking forward to seeing what can be changed I’ve spent time talking with Sean and it seems he has everything in hand, before I go can you shed any light on the piece above if so please write in. 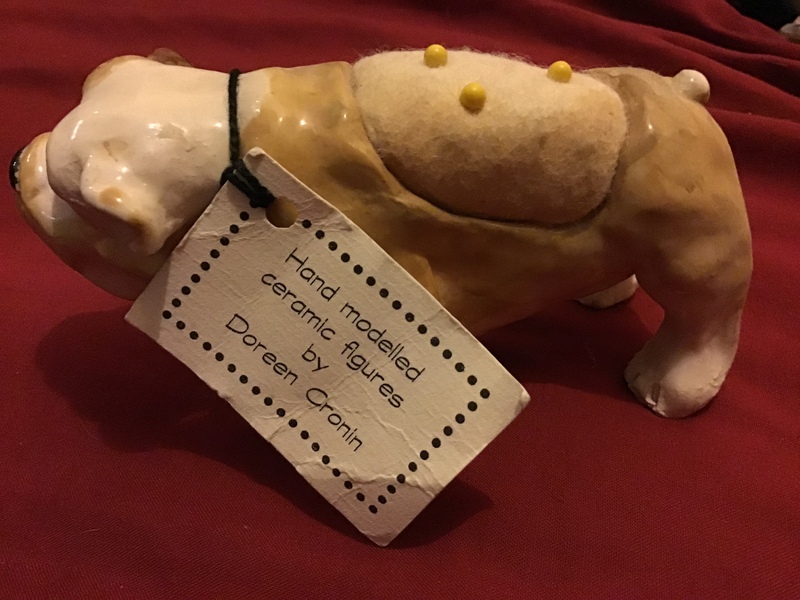 Bought this piece for Aves Collection,saw it was different,and he hasn’t got one in his collection.Handmade,A lovely addition to Collectibulldogs.